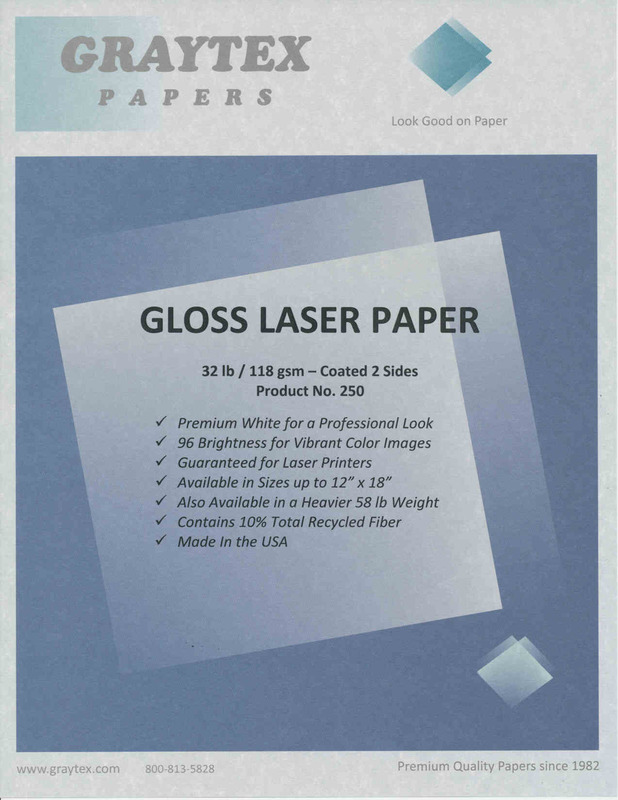 Laser Gloss is an effective glossy brochure paper or flyer paper. Corporate in-house brochures that duplicate the expensive appearance of a professional printing service are an ideal application for this two-sided paper. Suitable also for similar applications including advertising and presentation documents. The best use of glossy brochure paper for laser printers is to avoid excessive solid-image coverage. Use smaller images which complement the content of the page and include white space in the page design to allow the gloss of the paper to contrast with the imprint of the laser toner. Solid coverage applications are not ideal, because they will not give the high-gloss appearance the way inkjets will. What does the paper feel like? Laser Gloss looks and feels very smooth in the 32 lb. weight as well as in the 58 lb. Laser Gloss version. The choice between 32 lb. and 58 lb. is largely one of preference. The 32 lb. weight is appropriate for multi-page brochures, because it is thin enough to be more easily folded. We describe this paper as "magazine-like" in appearance, but the thickness is heavier than actual magazine paper and it feels similar to the weight of standard copy paper thickness. This is the best two-sided glossy brochure paper for a practical and effective replacement of commercially-printed brochures. Other applications include flyers, newsletters, one-page inserts, corporate reports and presentations. Compatibility: This Laser Gloss is ideally suited for color laser printing because it maintains the heat-resistant requirements to perform reliably in color laser printers. Lesser glossy laser papers are susceptible to melting or bubbling when exposed to the extreme heat of the print-fusing process in many color laser printers. Laser Gloss is also available in a heavier weight. See 58 lb Laser Gloss.